If you've rented an apartment or bought a house that came with window coverings in the last 20 years, chances are good that it came with the most annoying window coverings around: metal mini-blinds. They are really dust-collection sites in disguise as window coverings. They're impossible to clean, and the individual blinds are easily bent. Their one virtue is that they're cheap, and a houseful of any other kind of window coverings can be expensive, very expensive. If you want to dump those mini-blinds, but you can't afford to replace all of them, what can you do? If you can, replace the mini-blinds in your public rooms (great room, living room, dining room) with something more attractive: drapes, shades, valences, even wide wood blinds. Try hiding the rest of your mini-blinds behind valences. During the daytime with the blinds pulled up, you won't even know the blinds are there. 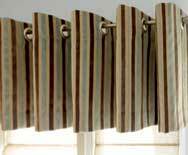 At nighttime, who's going to be looking at the mini-blinds when the blinds are topped with valences in great colors and patterns? There are a lot more options to valences than just fabric gathered on a traverse rod. Here's a contemporary look with grommets from Smith+Noble, an online window coverings vendor. Valences with blinds are a great choice for kids' bedrooms because you can replace and update the valences when the pony phase is replaced by the pink princess phase. You can be creative with kids' valences, too. 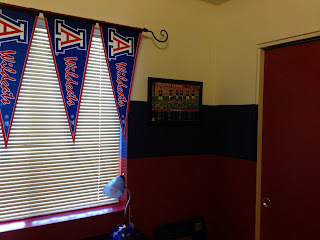 Interior designer Lisa Reeves and I came up with this valence made of University of Arizona pennants ($10) plus an inexpensive rod for one of our Habispaces' home designs. It was a big hit with the 11-year-old Arizona Wildcats fan who had just moved into a Habitat for Humanity home. Valences that use swags complete with tassels and fancy trim are not going to look good with inexpensive metal mini-blinds, so I'd pass on formal valence styles. 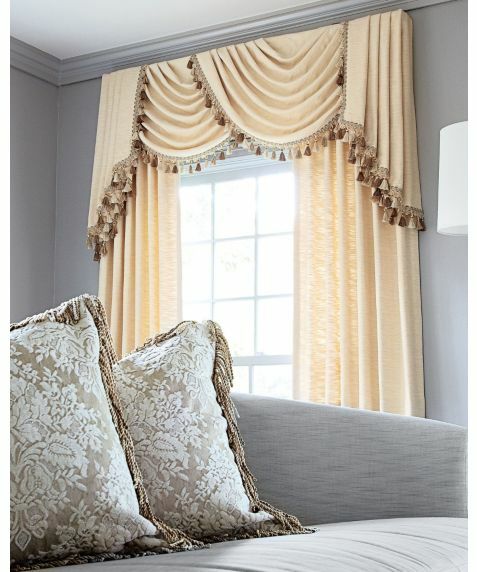 Formal valences also look odd without drapes. 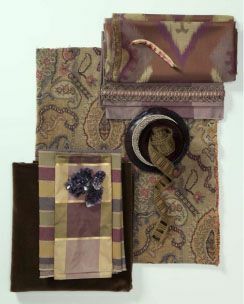 Even with drapes, it can be hard to carry off a swag look without rich fabrics and decorative accents. This one (also from Smith+Noble) looks formulaic. Ultimately, there is nothing like the unique look of custom window coverings designed by an interior designer who has access to thousands of fabrics, including fabrics made of recycled materials and other green options. Of course, you're getting that opinion compliments of an interior designer. Shut off that car alarm - please! Everybody can hear it and nobody's listening. We're just too used to alarms going off. Dogs barking, motorcycles gunning it down the road, planes rattling the windows, refrigerators humming - noise pollution is everywhere. Even if you didn't blow out your ears from dozens of rowdy concerts, a lifetime of lower level noise can be just as bad, even worse. The list of side effects from noise pollution and the side effects from the side effects goes on and on. Noise pollution raises our stress level, which has been linked to heart disease, high blood pressure and stroke. Kids from very noisy homes have delayed language skills, reduced cognitive growth and increased anxiety. For seniors with hearing loss, white noise makes it even harder to hear. Take a cue from medieval decorators who hung tapestries on drafty walls to keep out the cold and improved the castle acoustics, too. 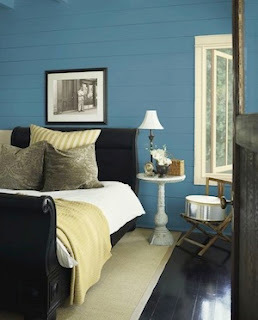 Think of soft surfaces instead of hard ones: drapes, fabric shades and upholstered furniture. 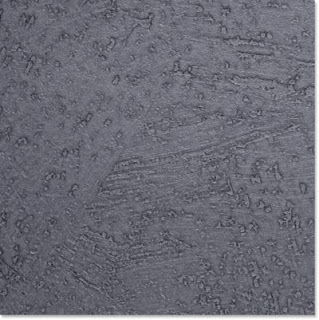 Carpeting is a great sound absorber, but if you've ever replaced a carpet, you know it's not a healthy choice. Dust, pollen, mold and more collect beneath the carpet. Standard carpet off gases many toxic chemicals, too. Using a rug that you can pull up and wash is a better way to cushion hard flooring. 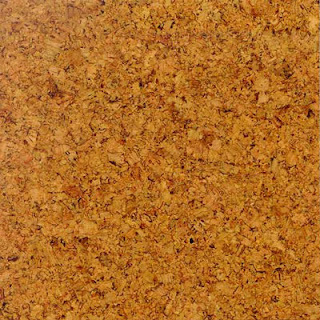 The best flooring choice for acoustic control is cork because its spongy texture absorbs sounds. 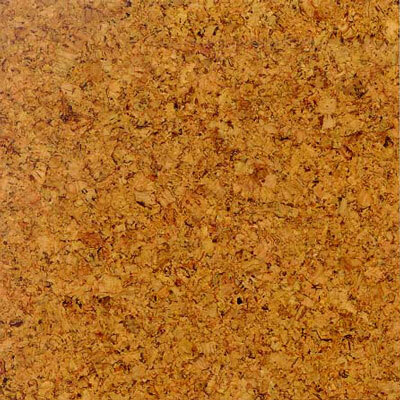 Some sound studios use cork tiles on the walls for acoustic control, and so can you. 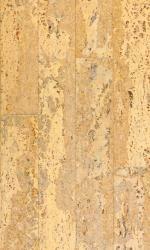 Today's cork wall tiles and flooring don't look like they were made for pushpins. 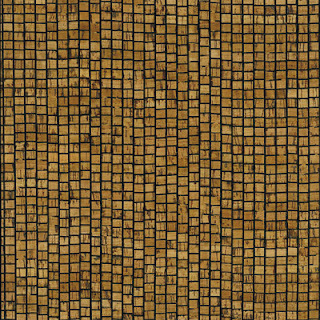 Expanko's patterns are anything but cork board style. Unicork even has a collection of metallic cork tiles. When it comes to plank flooring, U.S. Floor's Natural Cork is the thing. Of course, if you want the cork board look, it's around from Expanko and others. Even as I write, my computer is whirring, a car is driving past my house and, yes, a dog is barking and barking and barking. I have two reasons to replace the rest of my 1951 home's old casement windows: my electric bill and my sanity. For now I need to take a deep breath and enjoy the mountain view out my window. Several weeks ago I announced a contest to find recycled lighting fixtures for my own dining room. Suggestions are starting to trickle in. Since I received these fixture suggestions via Facebook, I want to share them here. 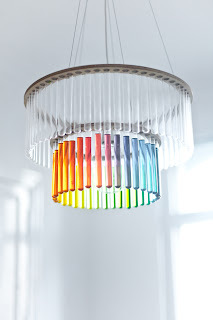 Christopher, my (computer) scientist friend, sent me a link to an amazing chandelier made of test tubes. They come in everything from clear, elegant tubes to brightly colored ones. Christopher suggested putting LED lights in this one. 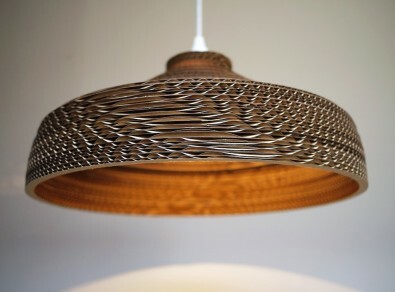 Carol sent this lighting fixture made of corrugated cardboard by Greypants. It's amazing how companies can make beautiful products out of such banal, disposable materials. Their website photo of an entire ceiling hung with different cardboard pendants reminded me of the temples that I saw in Hong Kong and the gigantic spirals of burning incense dangling from the temple ceilings. Last, but not least, here's a fixture that I discovered called "Pinwheel." It's made of twists of recycled aluminum. 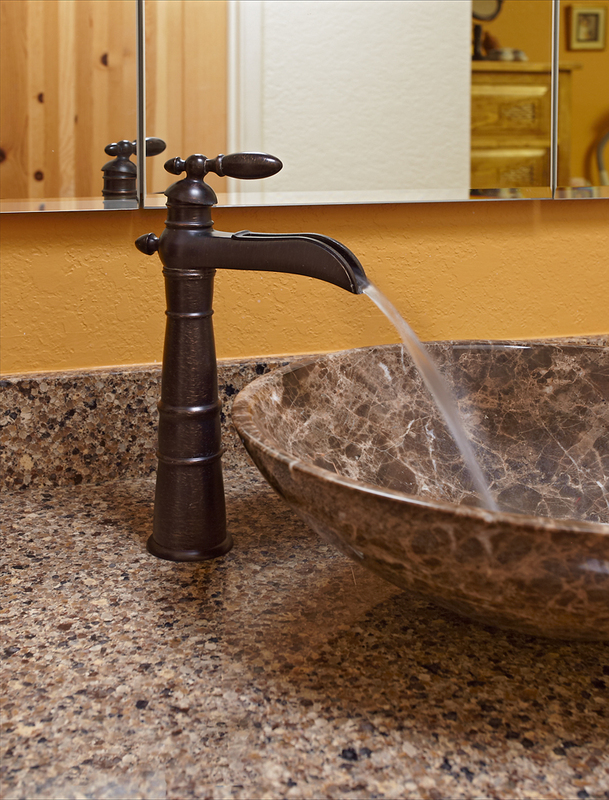 The manufacturer Veraluz is a great resource since all of their fixtures use recycled steel, recycled glass or other recycled materials. There are so many green fixtures available now, so join in the fun and send your link to a lighting fixture that uses recycled materials. Actually, this is nothing new. 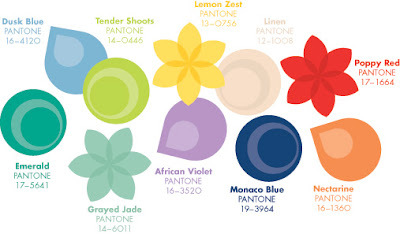 The “Color of the Year” typically is two colors because the two, important color-forecasting groups usually predict different colors. Sometimes their colors are similar, but most of the time, like this year, they choose different colors for the same reasons. Confusing? Yes. 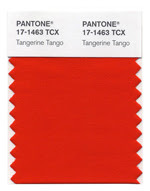 Both groups – the Color Marketing Group (CMG) and the Pantone Color Institute – forecast their colors of the year, as well as multiple color palettes, based on a slew of factors: the colors being used by high-end designers; color influences in media, music, art and digital design; current and predicted social, economic and cultural forces in America and abroad. 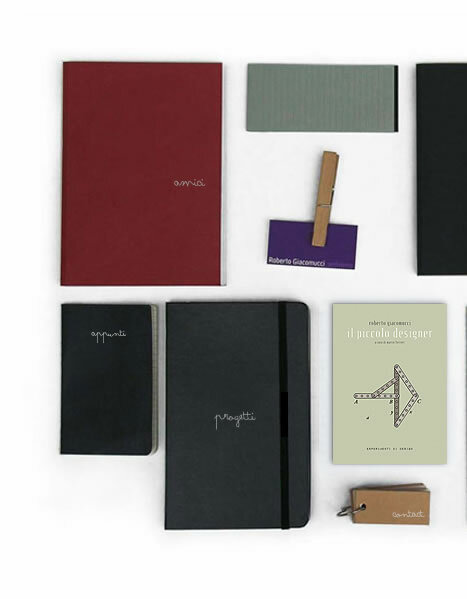 Pantone sends its employees out to research the world in pursuit of colors while CMG holds semi-annual conferences for their members, who are color designers. The end results of the CMG conferences are their color trend forecasts. Pantone and CMG’s forecasts are used for consumer goods, fashion design, interior design, graphic design, entertainment, transportation (remember the year of the purple car?) and more. Individual companies usually choose either Pantone or CMG to develop their colors. Not surprisingly, the economy has played a big role in color forecasting for several years. Both groups have chosen bright colors to foster optimism in trying times. Environmentalism also has been a factor in both group’s palette predictions, off and on since at least the mid-2000s. For 2012, CMG is predicting “Boyz-n-Berry” as its “NEXT” color (aka its color of the year). Boyz-n-Berry is already turning up in fashion. 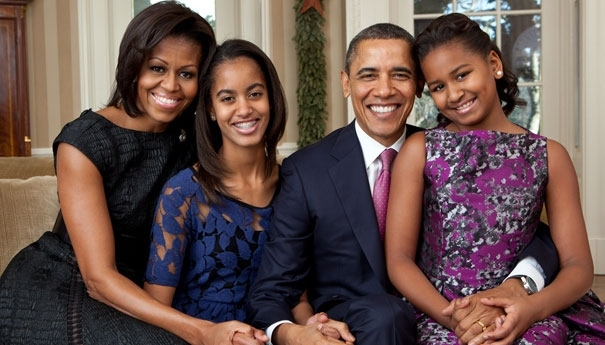 Here’s Sasha Obama sporting Pantone’s Color of the Year in the presidential family portrait. 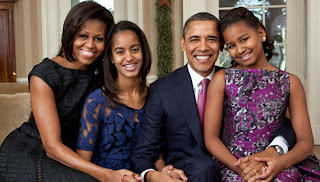 Her dad’s tie looks like a paler version of Boyz-n-Berry, too. I just hope that color-forecasting groups are not getting into predicting vampire trends. There's nothing like having something on your mind and then seeing it everywhere. Yesterday I received an email about a new catalog from a French company that uses recycled products, mostly reclaimed wood and pebbles, for their products. 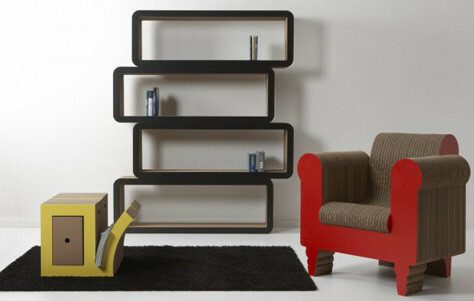 Bleu Nature designs furniture, lighting, accessories and textiles (not made of pebbles or driftwood). Part of what's unusual about their designs is that they're using rustic materials to create pieces in a contemporary (aka modernist) style. They're not the first company to use that combo, but it's hard to carry off, and they're not exactly successful at it. Some of their indoor furniture is interesting, and I can imagine their outdoor folding screen in a commercial setting. I've seen similar pieces in art galleries. 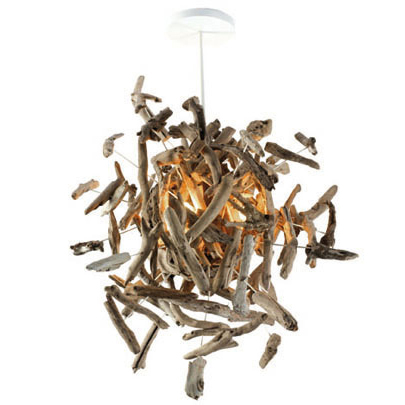 So here's one of their driftwood chandeliers. Here's one of their chandeliers made of "pebbles" although the pebbles seem big enough to be stones. My home may be eclectic, but I don't think rustic modernism will fit in. Eclectic design doesn't mean using everything you find on a beach. It’s the 12th of January, and I’m still planning on keeping one of my new year’s resolutions. 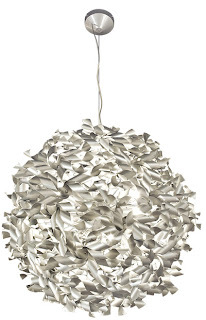 The resolution in question: To replace three ugly lighting fixtures in my home, which isn’t as simple as it sounds. My husband and I bought our house 10 years ago, and I’ve been living with lighting fixtures that I hate all this time. Why didn’t I just replace them when we bought the house? 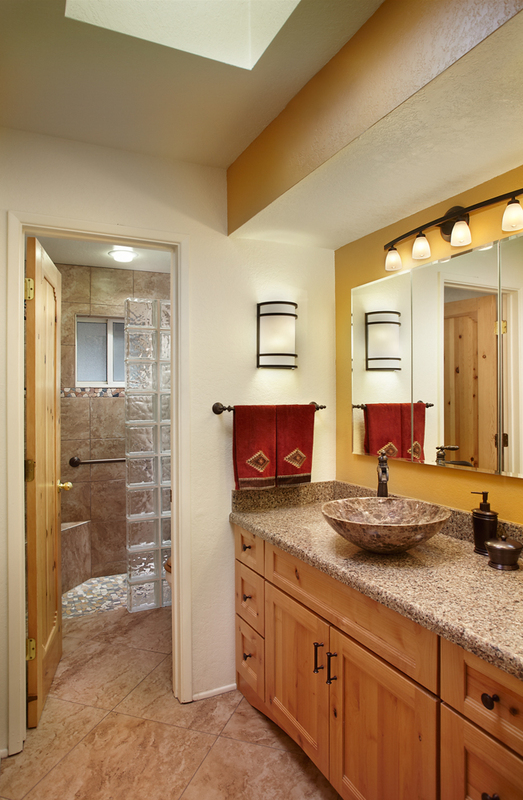 The project involves more than just swapping out the fixtures. The main problem is one that I see in dining room construction everywhere. The dining room lighting fixture is mounted in the center of the room instead of over the center of the dining table. If I wanted recessed lighting or a light fixture that hugged the ceiling, this location wouldn’t be a problem. But I want a pendant light over my dining table, and we designers are a picky lot, especially when it comes to our own homes. Changing the fixture location means cutting a hole in the ceiling drywall, patching the existing hole and repainting the ceiling. Although my living room, dining room and entryway are discrete areas, they share the same ceiling, and I only had time to paint the room walls, not the big ceiling, before we moved in. Since then, I’ve been busy designing other people’s homes and spending my discretionary time and money on traveling and a backyard renovation. 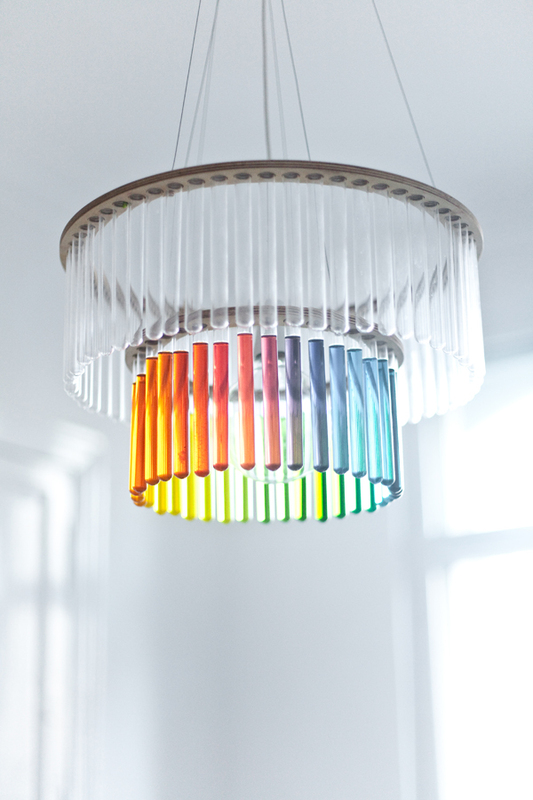 I also want a dining room fixture that uses recycled materials. There are plenty of them around now, but many of them are by artists or very small companies that make one-of-a-kind designs. I’ve seen fixtures made of everything from soda can pop tops to plastic spoons to bicycle chains. Many of them are too big, too expensive, too hard to clean, too fragile, too whatever for my home. So how do you and I find the right pendant light fixture for my dining room or for anyone’s dining room when the center of the room is not the center of the dining table? Start with the size of the space where the fixture will hang. The ceiling height and the size of the table matter, too. 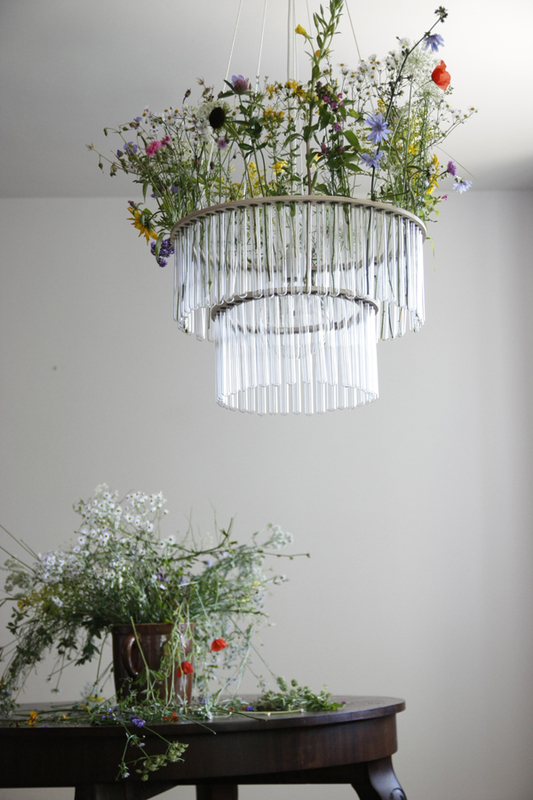 You don’t want a gigantic chandelier above a small table in a small space. You also don’t want a fixture that hangs so low that the fixture and its light annoy the diners. I won’t go into how I calculated my lighting fixture size, but I would like a pendant-style, dining room fixture that is approximately 24” wide with a drop of about 34”. (The drop is the height from the ceiling to the bottom of the light fixture.) The style of my home is eclectic, so pretty much anything is a possibility in terms of the look although I do want something reasonably durable (not made of playing cards, for example) and something that can be cleaned – periodically. I can’t spend the world on it either. Oh, I also want a smaller pendant light for my entryway. 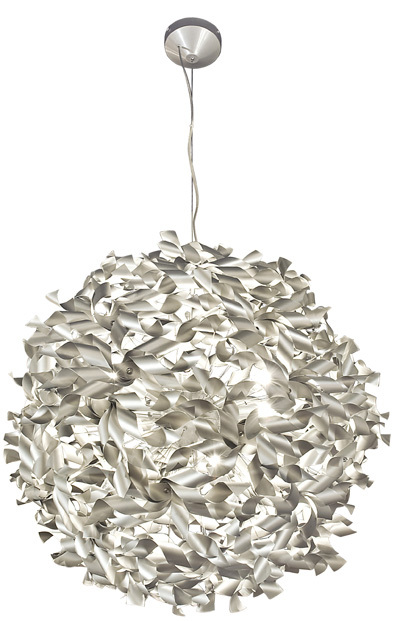 It needs to go with the dining room fixture although not necessarily match it. I’m also going to replace my kitchen light fixture, but it’s not part of this search. So post your suggestions for my dining room light with links to photos of the fixtures and information about them in the “Comments” section of the blog. 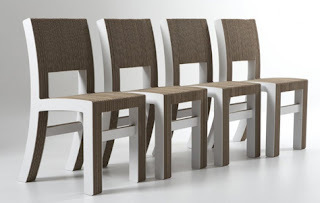 If you see any great fixtures with recycled materials that wouldn’t work for my dining room, post those links, too. 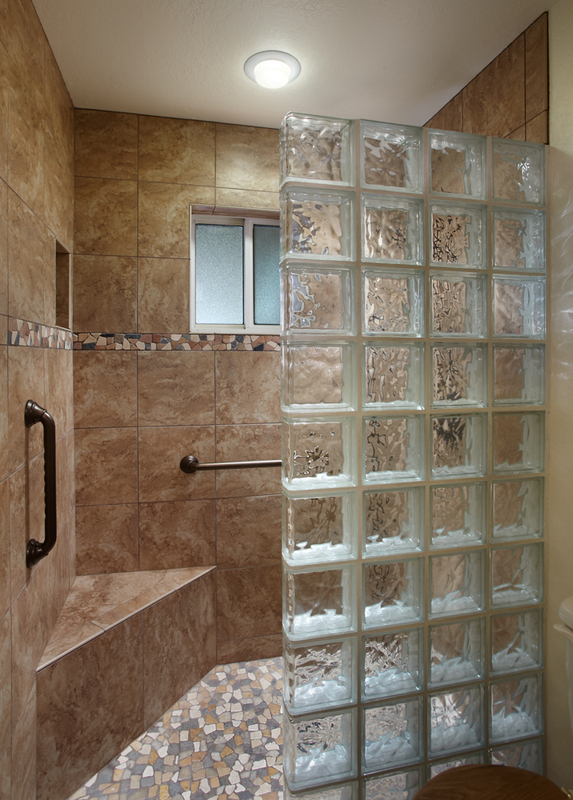 They may work for someone else, and looking at creative fixtures is always fun. This is a contest, of sorts. 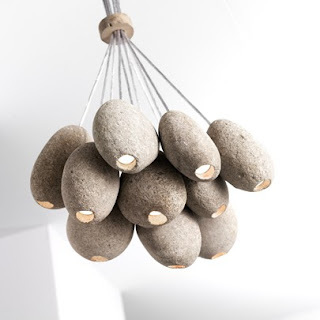 If my husband and I end up buying a dining-room lighting fixture that one of you submit, you’ll win a copy of the 2012 “National Green Pages,” a great resource for goods and services provided by certified green businesses nationwide. 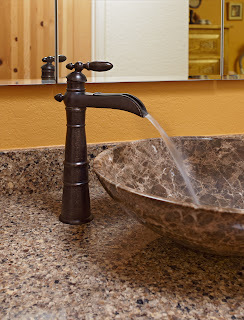 If I end up buying a fixture that I find, I’ll hold a raffle among all of the people following my blog and award the “National Green Pages” to the raffle winner. Yes, my husband does have a voice in the fixture selection, but I’ll vouch for his taste.